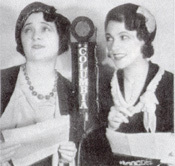 This soap opera ran from 1931-1942 and was one of radio's earliest important dramas. A vaudeville performer named Myrtle Vail created the show by basing the story on her real life. Apparently in order to attract Wrigley as a sponsor, she gave her characters the last name Spear and Minter (after the gum). She played Myrt, and her daughter played her character's daughter Marge. In their radio adventures, the two traveled across the country, facing love and violence. The show became popular enough to spawn a movie in 1934. Myrt and Marge also included a memorable theme song, "Poor Butterfly."